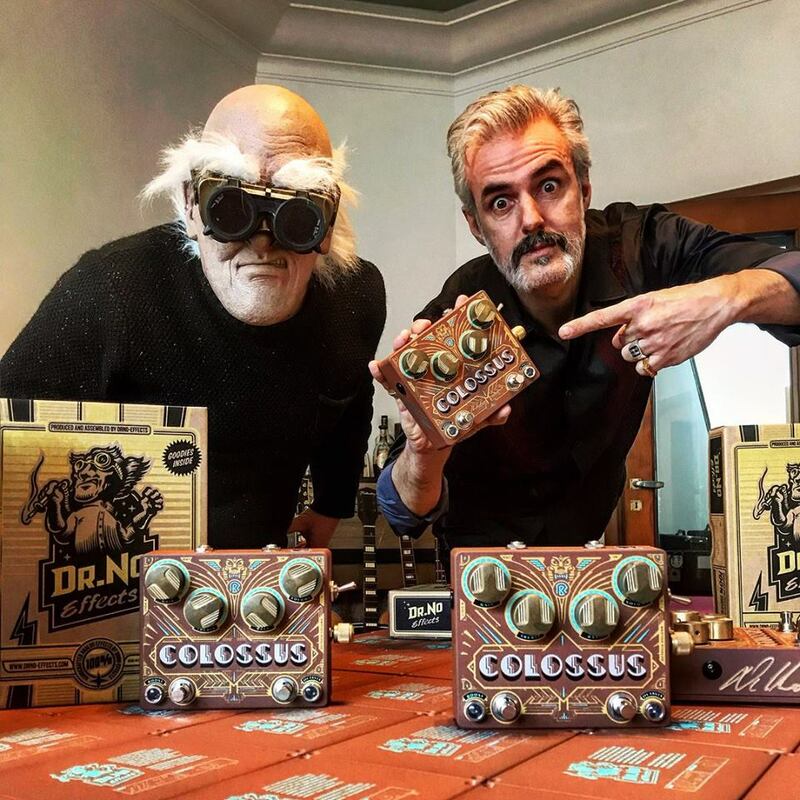 Dr, No Effects and Ruben Block proudly present the COLOSSUS! “Ladies and gentlemen! Finally! He’s here! The COLOSSUS guitar and bass pedal! The amazing Dr.No Effects isn’t just your average pedal-pusher.He’s a very creative individual who makes something unique, with personality and attitude and already worked with some amazing players to show for his tallent and craftsmanship in the field. 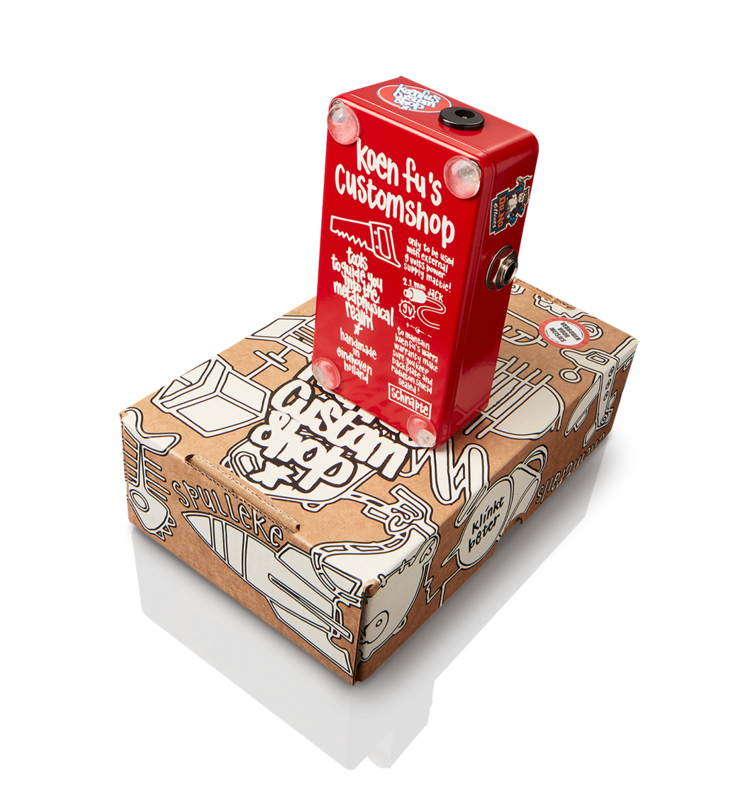 A long time ago we started talking about trying to create a tailor-made, limited edition guitar pedal. Something that would work with- or deliberately against what was already cooking on my 9-volt-infused-power-plant. Over the past two years he started making prototypes, we went back and forth between his laboratory and my little noise-shack. Eventually decided what part of the electrified-animal-kingdom this new creature was going to live in. A two-faced OCTAVIA FUZZ combined with a GRITTY BOOSTER was born, to be used separately or all together. We started test-driving, back and forth, changing, rearranging, taking it out on the road and eventually to Santa Monica where it ended up all over our new album COLOSSUS on both guitar and bass. I’ve been using the prototype for the last two years and I’m very happy to have the amazing final version (with handmade brass knobs!! ), on my board today! Thanks Doc! I had so much fun providing input and working on this together! We just hand-signed and numbered the first units! Beware, this is no subtle piece of machinery! 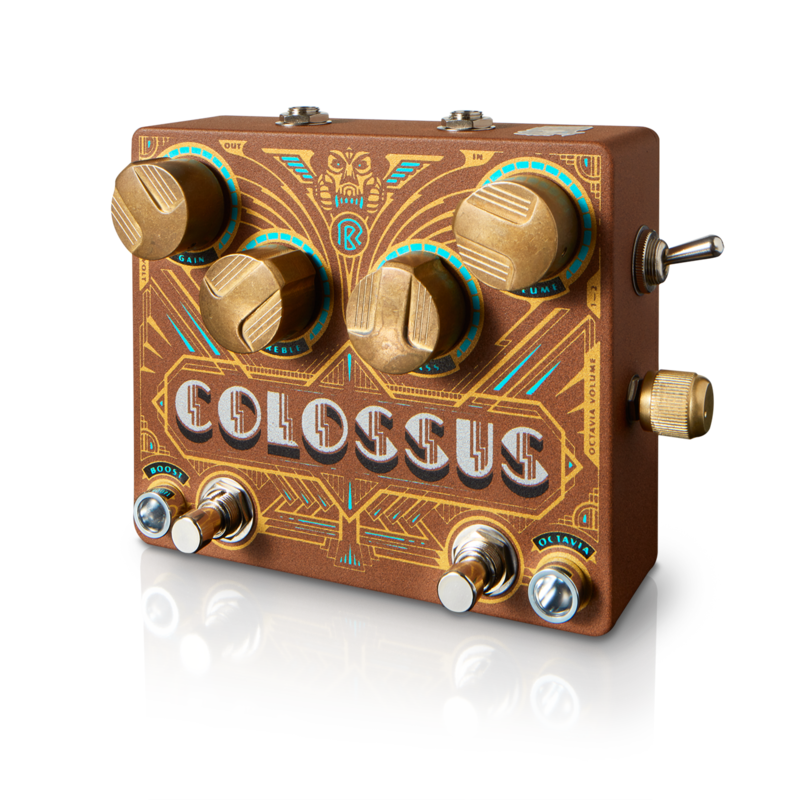 The Colossus is a High Gain Booster with the character of a gritty Fuzz, like we know of Ruben Block’s famous guitar tone. Together with this High Gain Booster, the COLOSSUS has an Octavia Fuzz built-in that can operate together but also independently from the Booster. There are many possibilities with the COLOSSUS. For example, the Booster has a fine to be adjusted Volume, Tone, Bass and Gain knobs. The Octavia Fuzz has a Octavia Fuzz Volume on the right-hand side and a two-position Gain switch. 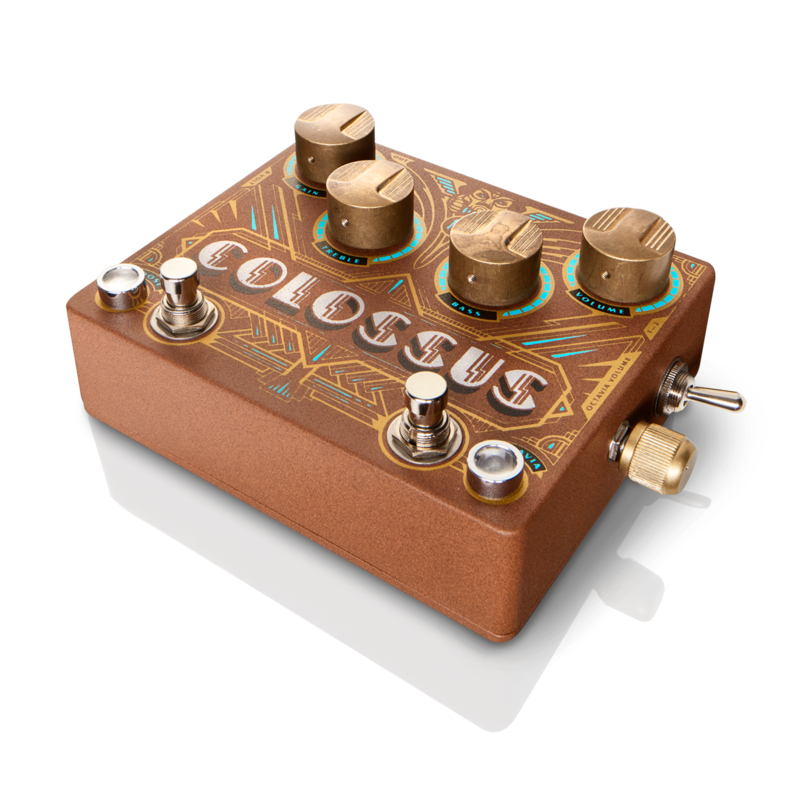 The COLOSSUS was developed in close cooperation with Ruben Block to broaden its famous and signature sound, that is now also available for the heavy minded Boutique Guitar Effects lovers. The COLOSSUS has been used and can also be heard on Triggerfinger’s latest album with the same titled, COLOSSUS. The Buttons are handmade by an American fine metal worker, who put a lot of effort and time into manufacturing these beautiful solid brass buttons, resulting in these million dollar looking knobs. These are a custom made series only available with the COLOSSUS. 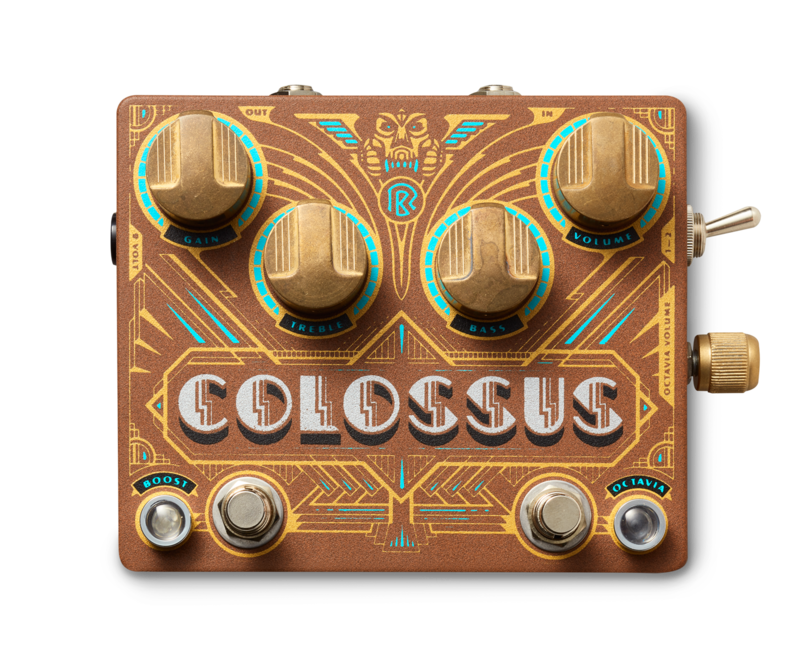 The COLOSSUS Housing has a rustic rust powder coating that is hand-screen printed with a custom made four-color design in the Art Deco style. 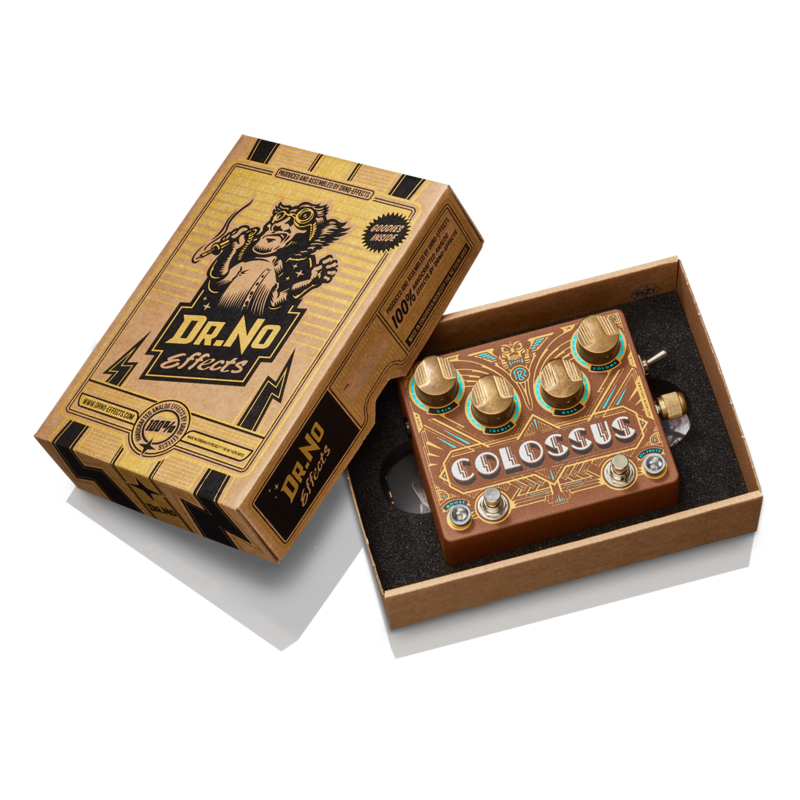 The COLOSSUS is a limited edition, hand-crafted individually from A to Z, and hand-signed but also numbered by Ruben Block and Dr. No. The Release will be late March 2018, but be there soon and expect a waiting list to get one here. Release date will be announced at Dr. No’s and Triggerfinger’s social media platforms. Function Booster: Volume, Gain, Bass, Treble, On/Off footswitch with led indicator. Function Octavia: Volume, Two way Toggle (Right side of the pedal), On/Off footswitch with led indicator. Box: Handslikscreened Box with Gold and Black, Foam inlay. has an internal with two sepparate handcrafted and assembled PCB’s. David Catching “Got Fuzzed By Dr.No”! 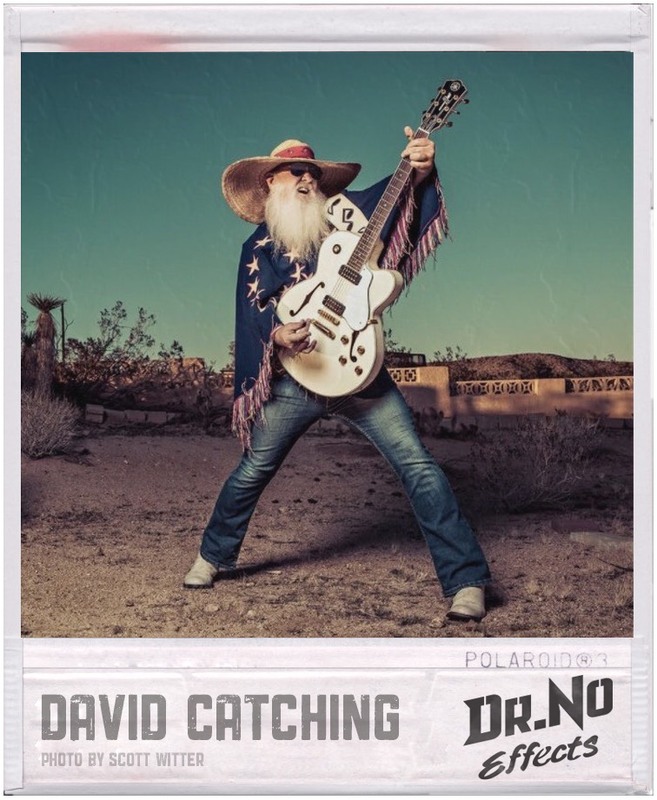 David Catching joined the Dr.No artists club! NEW RELEASE KFC AND DR. NO EFFECTS “CRYSTAL BOOST”! Dr. No worked and collaborated with artist Koen Fu on a new “Boutique-Boutique” guitar effect. at the famous Dr. No Effects headquarters in eindhoven holland . 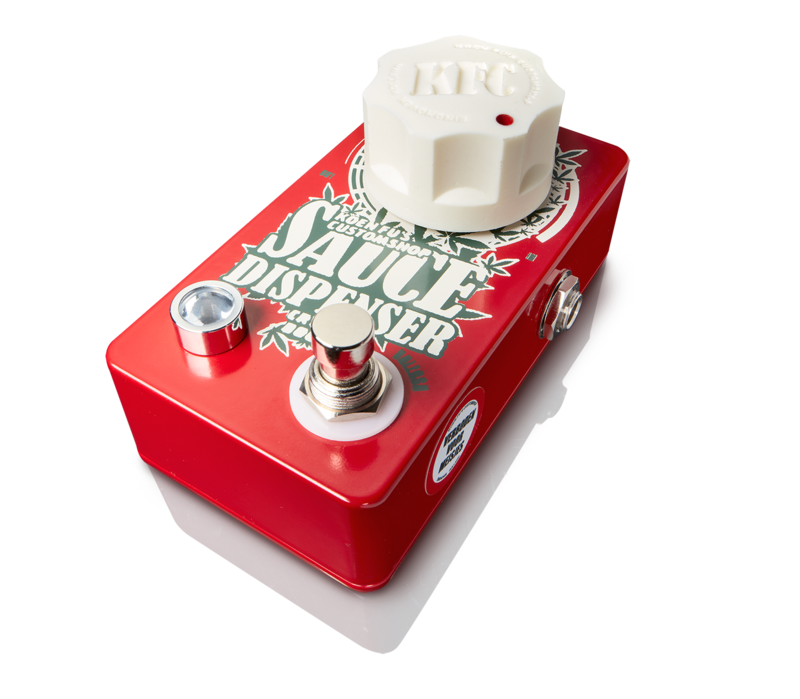 This collaboration led to the development of the illustruous ‘KFC Sauce Dispenser’-series, ‘Crystal Boost’ pedal. The device, which is a high end clean boost pedal, is said to metaphysically connect our physical world with the spiritual world, by incorporating the widely discussed ‘chrystal skull‘ technology, developed at Koen Fu’s Customshop. 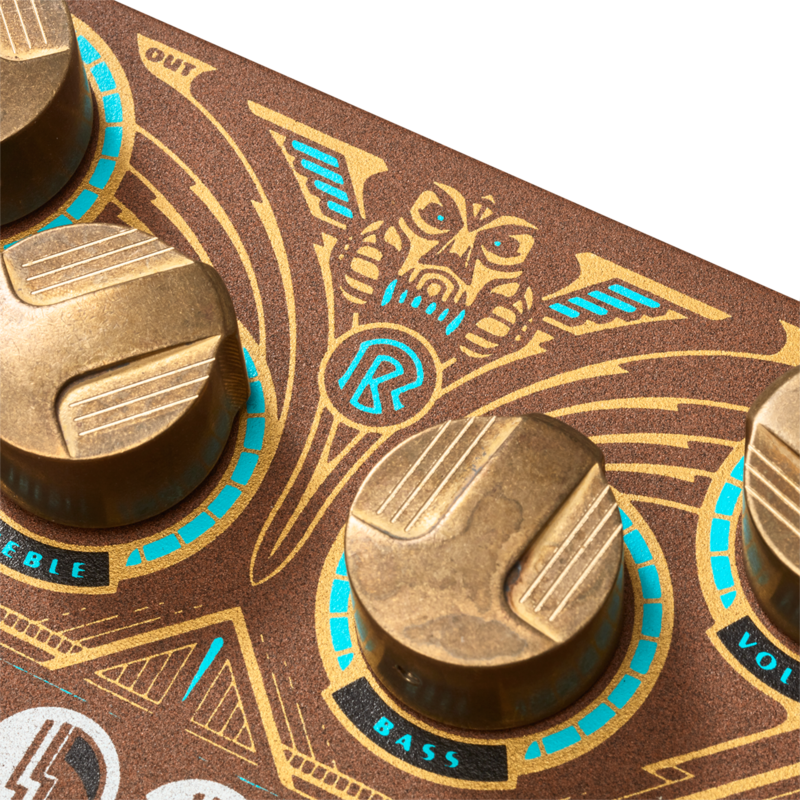 It’s circuitry is designed by Dr. No and meticulously tweeked to the sonic preferences of Koen Fu, who worked on the pedals’ concept and graphic design. 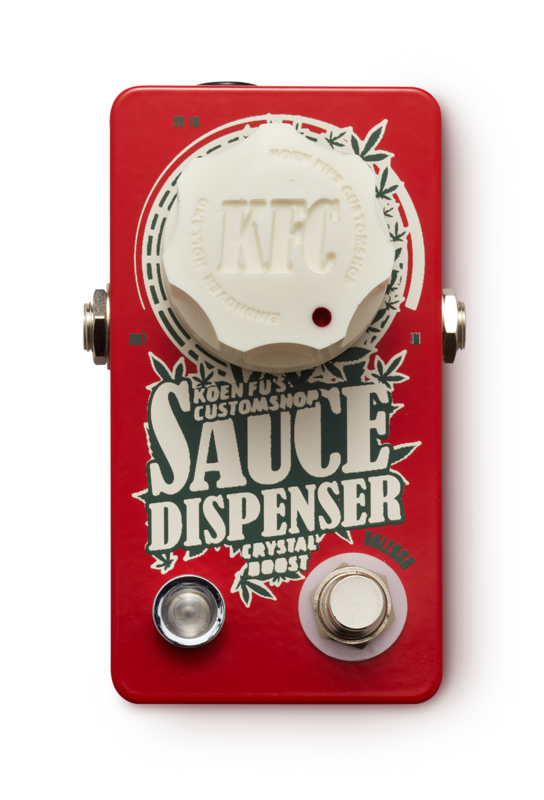 After purchasing the pedal, Koen Fu will perform certain rituals at his Custom Shop, directed to the performance of the Chrystal Boost pedal, which obviously are all clouded by thick smoke… Those who have been following KFC videos online, probably are acquainted with these, and it is said, he hereby is releasing an additional metaphysical potential upon every unit sold. 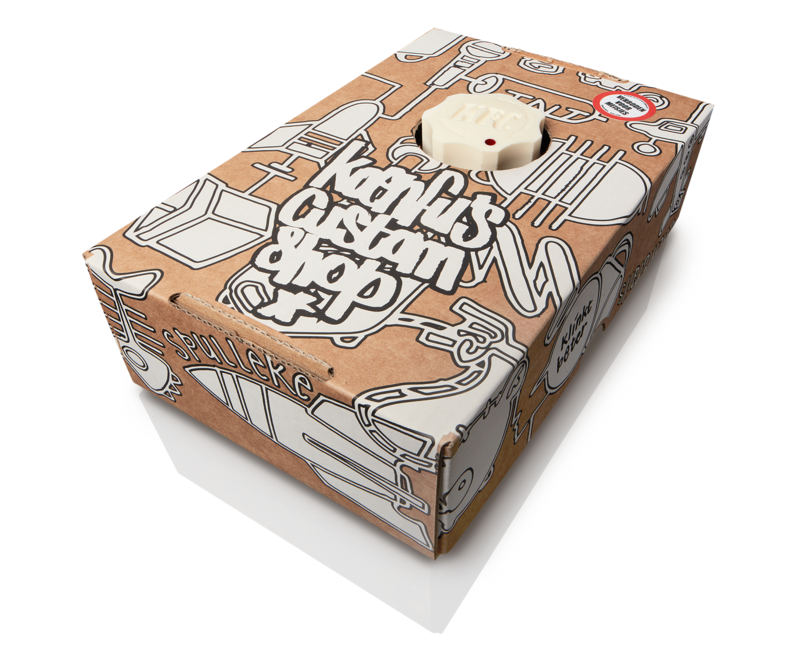 The back of this ‘boutique-boutique’ boost pedal states KFC is about creating ‘tools to guide you into the metaphysical realm’, and if you pair this with the already impeccable status of Dr. No Effects, you know this guarantees instant awesomeness and outstanding quality on your pedalboard. August 2017 sees the official release of the Chrystal Boost! Please also check the Dr. No and KFC Sauce Dispenser Crystal Boost demo and video “HERE”.